Rockingham, where we are staying, is a suburb by the sea. Being by the sea, and having a good sized lake you can walk around are its redeeming features. Here, signs to the town centre lead to a gigantic shopping mall. One night we went looking for take-out Indian food and were directed to a far-flung corner of this mall. This is where Rockingham's available night life clusters around an inadequately sized multi-storey car park, surrounded by broad avenues and immaculate central reservations. There are no pavements, but then, you aren't expected to walk here. The street next to us has a sign on it saying Tidiest Street of the Year, though it looks exactly like all the other streets. The whole thing reminds me irresistibly of the Pete Seeger song Little Boxes. You know: "There's a pink one and a green one and a blue one and a yellow one, and they're all made out of ticky-tacky and they all look just the same". Both the tidiness and the ticky-tacky have just been put to the test. On Sunday, Rockingham and the surrounding area suffered the storm of the century. Antonia and I were cuddled up on the sofa, watching a kid's movie and pretending to be scared. Then we discovered that the wind was nearly blowing the front door out of its frame at the top and bottom and we really were scared. It took all three of us to push the door back into place enough to get some extra bolts in. In the aftermath of the storm, fences, ornamental fountains and bits of trees are lying all over the place. I believe a few people lost their rooves and lots more lost their power supply. 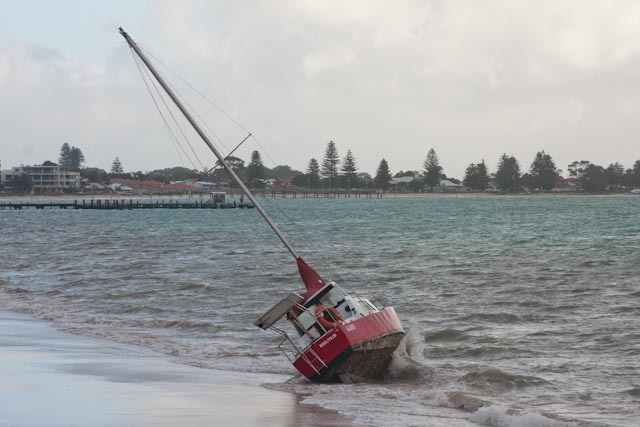 More spectacularly, several boats were torn off their mooring in the bay and washed up on shore. On Monday night we had a repeat performance. I have been wondering what it would be like to be at sea in this. We embark on Thursday and fortunately the weather forecast is looking fine for us - assuming the Dawn Princess can limp into Fremantle in the first place!! The Catalpa Memorial - it's a tribute to some Irish political prisoners who escaped Western Australia on a ship that came all the way from the USA to break them out! It turns out that Rockingham has been quite exciting. It's also been a good base for us to have an affordable house while we run our visa related errands. Soon we will be leaving for Asia. I am really looking forward to getting back to the Old World again! I really do feel more comfortable with a couple of millennia of continuous history beneath my feet.